Have you ever seen someone wearing a kimono? 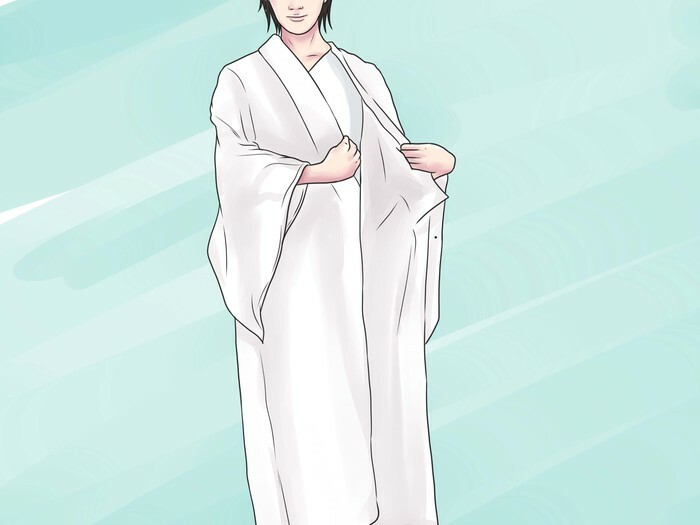 It's a traditional Japanese outfit, once worn exclusively as a formal garment but now often used as a robe. 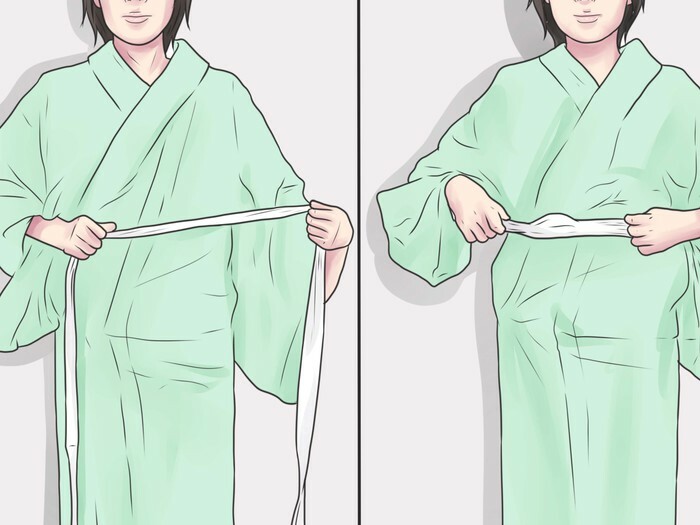 This article will help you learn how to wear a kimono in the customary Japanese manner. Purchase a kimono. You can go someplace like Japantown in San Francisco, or you can buy a kimono on an auction site like Ebay. There are also online stores that specialize in kimonos, like Ichiroya, but these may take longer to ship your kimono. 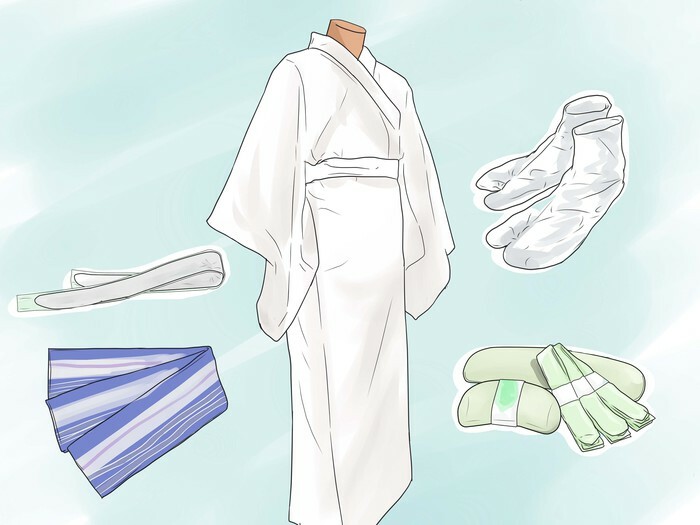 In addition to the kimono itself, you must have a juban, a koshi himo belt, a datejime, an obi makura belt, and white tabi socks. As you're getting dressed, put on the white tabi socks first. 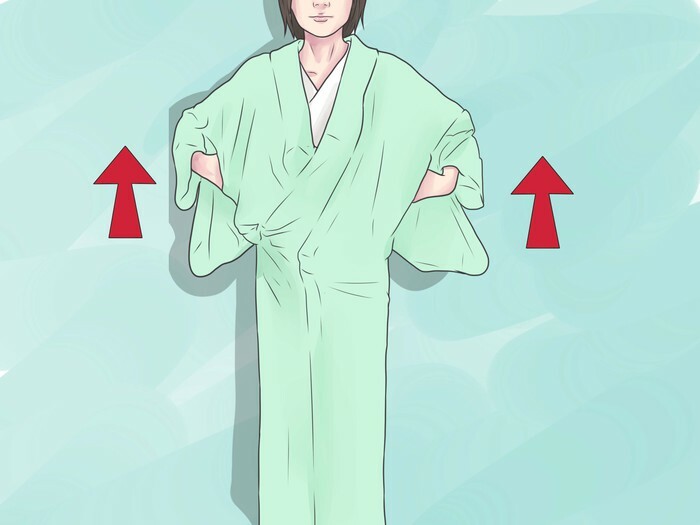 It is difficult to bend down after dressing fully in a kimono, so you should get the socks out of the way while you can. Put on a slip called the "juban. " It consists of a white cotton top and skirt, which you can easily substitute with separate pieces if you can't find an actual juban. Today in Japan, an alternative is to wear only the white collar that goes around the neck called a "cri-sugata." Put on the kimono, making sure the back seam is centered. 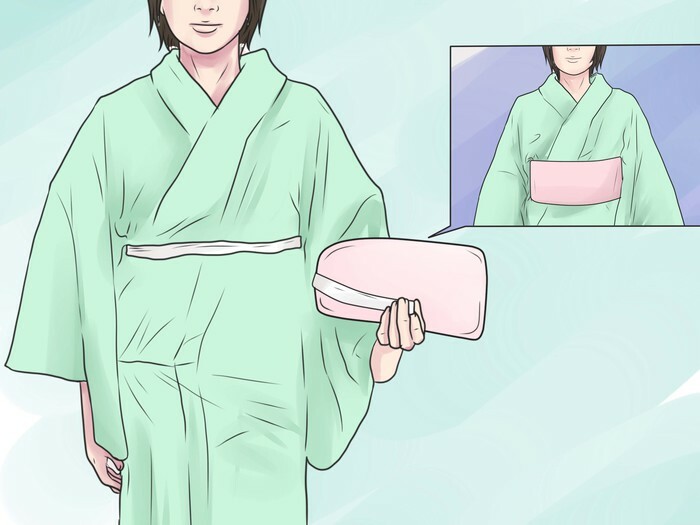 For both men and women, you should wrap the right side of the kimono over your body to begin with, then bring the right side of the kimono towards the left side of your body, overlapping it with the left side as you do so. Adjust the white slip collar to show evenly around the neck, just under the kimono collar. After you have put on your kimono, pull the kimono so the it ends at your ankle. The length of the kimono is always adjusted, which is why there are only a few lengths made by the manufacturer. As you hold the extra material about your waist, tie the koshi himo belt below the excess material. Cross the belt in the back and tie it in the front. Straighten out the excess material and bring some down to cover the koshi himo belt. Now take the datejime belt and wrap it around your waist over the koshi himo belt. Tie this belt in the front, leaving the overlapping kimono fabric visible below. 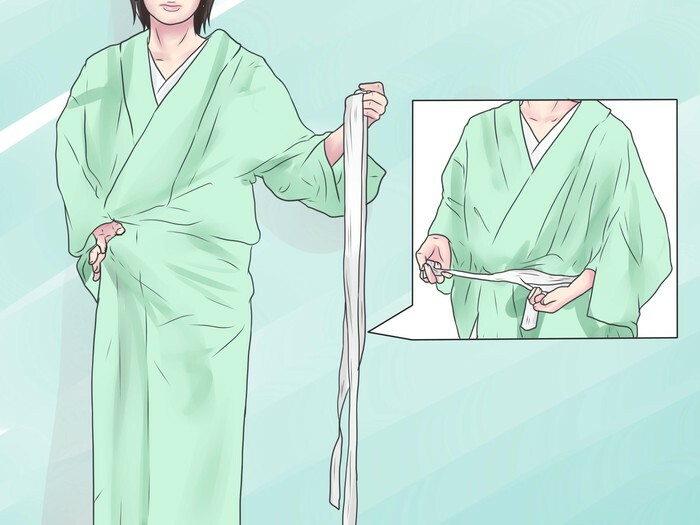 The excess kimono fabric should hang out evenly below the belt so that the fabric is seen. Put the obi makura into place and wrap the obi. Tie both ends of the obi together, folding it in across your waist and tightening it at the center. Then slide it to your back, straighten yourself out a bit, and you should be all dressed up in your kimono! Tying up your hair into a bun and adding small hair ornaments will add extra flair to the kimono. Geta sandals are another cultural concession you can make if you'd like, but they're not totally necessary. 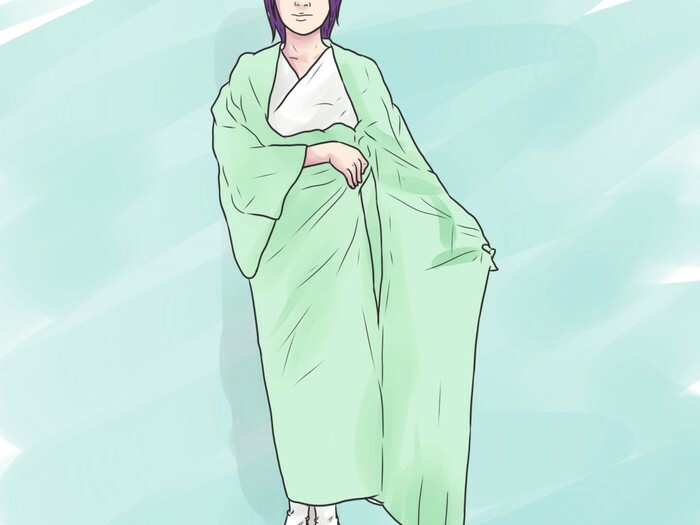 Don't worry if the kimono is a little long; that's how it should be! 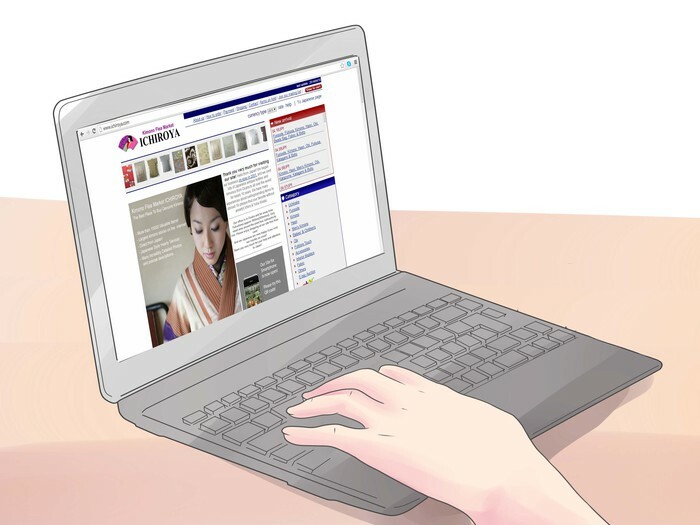 Kimonos and their accompanying accessories can be very expensive, so buy carefully and try to search for bargains online. Alternately, if you're willing to travel to Japan, used kimonos can be found there for prices between USD $5 and $200. A traditional Japanese Kimono made of Silk can run past the $10,000 mark and, with the accessories, can easily go up to $20,000.